Clean Space: you can decrease startup time! Starting version Clean_Space 7.17 we're introducing new great feature: management of supported applications. Using this feature you can decrease startup time for our program. In short, every time when you start Clean_Space it search and detects all supported apps on your computer, even if you don't have some. This process usually takes few seconds, but we have decided to improve even this part! From now on you can disable detection of unnecessary apps which you don't have or which you'll never have in the future. Or those which you don't want to appear in the cleaning list. Really, why we waste our time searching for apps which you will never have? Thus Clean_Space will start much faster, in less than a second! Open Settings of the program. Uncheck checkboxes against that apps which you don't want. 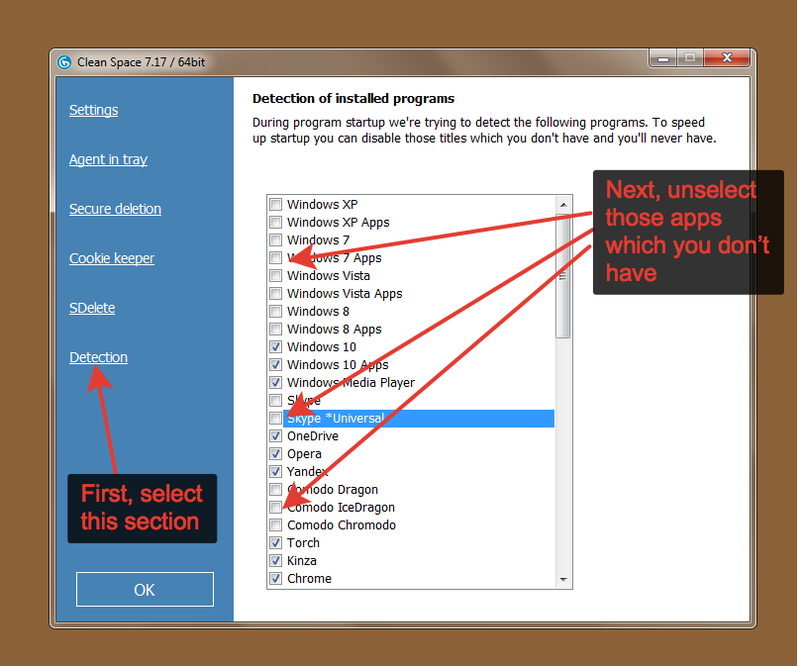 Clean_Space will not search for them anymore, even if they are installed on your computer, Clean_Space will skip them. For example, you use Windows 10. This mean you don't have Windows XP at this time, right? And Windows 7, Vista and 8, right? So, disable checkboxes against these titles and Clean_Space wont search for this operating systems anymore! Or, for example, you don't want to see Skype in the cleaning list, or you don't have it installed. Disable checkbox against Skype and Clean_Space will not waste its time for this app. This feature is for advanced users, and if you're not sure just leave it as is: all enabled.